It is a little known fact that mudlarks must be licensed. It is a little known fact, because very few know what the thoroughly modern mudlark is. According to the Port of London Authority, a mudlark permit is awarded to any metal detector who wishes to dig in the mud on the foreshore of the River Thames for treasure- to a depth of up to 1.2 metres. But not just anyone gets a mudlark permit. You have to have had a standard permit – one which allows digging to 7.5cm – for two years, and to have had a proven record of reporting your finds to the Museum of London, before the PLA will even think about issuing one. The river police are quite hot on this, it seems. They can arrest anyone digging enthusiastically without a license because the Museum of London guards the finds on the Thames, between Westminster to Wapping, zealously. Take a look at the strange but wonderful website of the Thames and Field Metal Detecting Society and you will see immediately why. Sword hilts, cannon balls, belt buckles and buttons, dandy clay wig curlers, bells, keys, knives and forks: the list is apparently endless, stretching from Roman times until the present day, a record of the social history of an ancient metropolis. Mudlarks have been trawling the Thames mud forever, though it is a dangerous business, dicing with the tides and the quagmire. A mudlark could scavenge things to sell in the 18th and 19th centuries, making a spare living. The mudlarks were usually children or OAPs, mostly boys but a few girls. The outspoken but highly engaging TFMDS site came to mind yesterday as we walked on the beach close to our holiday cottage in Folkestone. We love to trawl for bits of old pottery and glass. Dover and Folkestone are ancient, if bawdy, settlements with histories stretching back past the Roman Portus Dubris to the Bronze Age. Ever since then,social artefacts have washed into the sea, and drifted aimlessly in the English Channel. We sat waiting for my mother to finish talking to another dogwalker, in the baking sun, on a utilitarian concrete slipway, and my husband drifted off to comb the beach. Five minutes later, he was back with a find. It is a very thin spoon head, with the most delicate neck. Its bowl is an engaging ellipse bent by the tide. Though Roman spoons have been found in the area, the join between the stem and bowl is fan-shaped, and we can find no other examples of this in Roman spoons. If it hasn’t rusted we hazarded that it might be pewter, a common alloy between the 16th-18th centuries. Phil thinks it’s 1820s: we have found similar examples in our trawl of the internet. But it’s so thin: so delicate, as you hold it in your hand, a puzzle from another time. There’s something about it that just feels earlier. The children immediately disappeared, off down the beach, intense concentration on their foreheads. They were off to make their own finds. I paused to wonder: should sandlarks be licensed? Better not dig any deep holes. Posted in London, Quirks of History, Shrewsday MansionsBookmark the permalink. 🙂 No more than you, Julia. I have been following your blog with interest- you write with such integrity. Maybe it was a little Roman child who forgot his bucket and spade. Had to make do with the trifle spoon instead. Bet he cried when he lost it. Maybe it was, Myfanwy: it would more likely be some uncouth Folkestone sailor, on his way to smuggle something or threaten someone. And the infuriating thing is, we will only ever be able to tell stories. We will never know for sure. Maybe Mike Webber, MoLAS and marine archaeologist could help. I think he can be contacted via the Thames Explorer Trust and this outfit http://www.thamesdiscovery.org/about/ but I believe he has also done work on the Kent coast. He is a very entertaining speaker, and his foreshore walks are fantastic. Oooh, wonder if he’s on Twitter, Isobel? He sounds the sort of person whose talks I should try to get to see! How exciting! I would be digging all day 🙂 Good luck to the children on their treasure hunt. Good thing a license is not needed for a lark on the sand. Beautiful artefact. You seem to be having an idyllic holiday. We are lucky, it’s true, Roger. There’s so much to do here. Is this true? I’d be so busted. 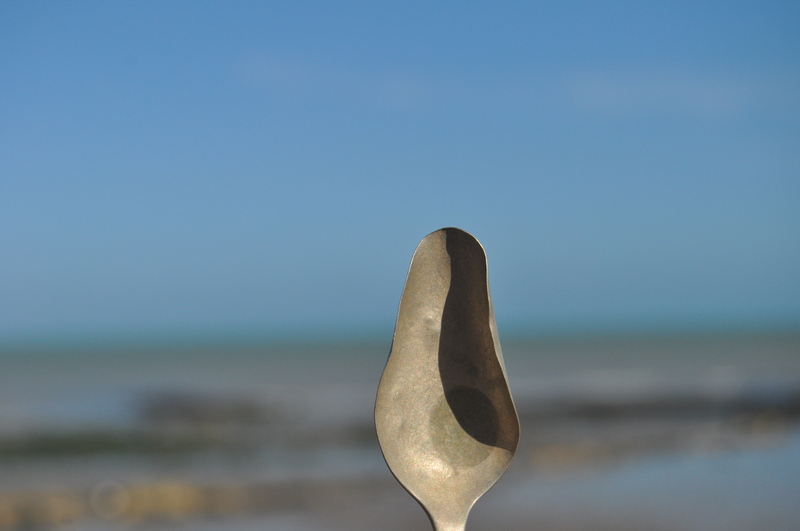 I live for quirky little finds such as your spoon and beaches offer up the best-est. They do, Hudson! But take a look at that strange website I linked to, the Thames metal detectors. Their finds are just the stuff of dreams. Mudlarks?! How very, very interesting, Kate and what an intriguing find for Phil. Here I roam, just looking for feathers, and there you are, on holiday, sifting sand and finding artifacts while your mum chats with a dog walker. I am in awe of how much you and your family squeeze into a day and of your amazing way of telling a story. This time of year is a precious one: the school hols are a perfect time for exploring, and we choose our holiday destination so that we are in the thick of the history, Penny. If you are ever over here you simply must come for a tour of this area. It’s compelling! Are you allowed to keep your find though? Sounds like the museum can decide to keep it? then again, you guys are perched on stacks of spoils – you’re so lucky! So I take that real treasure troves, like ancient, decaying bags full of Viking treasure, for instance, gets taken away? Guess that makes sense – some idiots would probably try to melt it down and sell it when it’s in fact, priceless. Sorry, I’m rambling. Another great post – I love how you and yours find interest anywhere and everywhere, and then add some of your own to make it even better. I know what mudlarks are only because I read a lot of historical mysteries set in London, and they’re always talking about the mudlarks along the Thames. Nice find, Kate! I’d be sorely tempted to dig up that entire beach to see what else I could find. And thanks for the link to the Thames and Field Metal Deteecting Society—I’m going to have fun looking through that. It is a scream, Weebles. Outspoken (to put it mildly) and grammar has no place there. But the things they have found and their dedication to what they are doing- historically- is incredible. I hope you will update us if you find anything more about the provenance of the spoon. It is great to see that you’re having sunny weather on your holiday. This afternoon, less so, Andra: but it was still great. Mizzle is ok. And it’s passed now to leave a rainbow over the Channel. There are always results there, Debra: washed glass, old pots. Last year we found a Victorian marmalade jar. Lovely stuff, really. Good on Phil. The most I’ve ever found digging on the beach is plastic spoons and pails. 😀 Maddie’s on the case, Fiona! I’m torn between nodding mournfully in agreement and spluttering uncontrollably at the muppet-style talking spoon enactment which is now playing in my unfortunate head, Lameadventures…an over active imagination is a curse. I’d pay Broadway theater ticket price to see that Kate! Dear Kate, I know about skylarks from reading Shelley’s poem in high school. (Am I remembering correctly?) But I’ve never heard of mudlarks or sandlarks. Do you have time to explain why the word “lark” is used in these two terms? That interests me. I’m wondering if I’m a booklark. Peace. ‘Lark’ is an old word for playing. We’d have ‘larks’ if we were having fun, and there’s an antiquated saying, probably from Enid Blyton or somewhere: “What larks!” Some etymologists have speculated whether ‘mudlark’ is a wry inversion of the word ‘skylark’ , or one who plays in the sky. But its a sketchy and tenuous connection. I know! I know! It must be the original spoon the dish ran away with! Did you see any signs of felines or violins? I seems like a delicate an interesting piece, indeed. So interesting to be able to picture the area where you are – after all the intimate familiarity of a week’s stay! We were in that whopping great hotel, though. I did see a cat sneaking off, actually, Col, now you mention it….hmmmm….which hotel did you stay in – White Cliffs? We English are a peculiar breed. I’ve read of mudlarks before, very interesting. The spoon is fascinating, left behind by a very long-ago picnic party? mysteries – I read every Sherlock Holmes story by age 14. Now I know what a mudlark is! 😀 They are great character-fodder for 19th century-based novels, Pseu. We did think that: only the plate is still intact in some places and not worn away. I suppose we’ll never know! So that’s what a mudlark is! The shape of your spoon is so fascinating. Makes me want to each through the screen to race its edges.